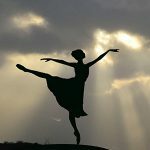 The least imaginative response to this lack of good new subjects is simply to go back to the big lives and do them over — and over — again. You can justify this by an appeal to the idea that each decade (actually, every four years might be nearer) needs its own Dickens or Eleanor of Aquitaine. According to this convenient way of thinking, dressing up old subjects in new clothes becomes playful and postmodern, rather than just desperate. We can save all of the examples in the article and use one family as proof that the field has been picked over: the James Family. From Henry James, Sr., to the two brightest stars, Henry Jr. and William, to the “lost” sister Alice, they have been portrayed one by one and collectively, psychoanalyzed, been the subject of sexual investigation, and turned into fictional versions of themselves. Henry Jr., the author of The Portrait of a Lady, The Turn of the Screw, and other classic works has been especially exposed. Was he gay? Did he die a virgin? What does his chronic constipation say about his psyche? Certainly within the last few years, the pace of the publication of the books about the James family has quickened. 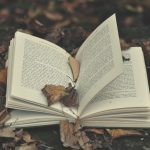 One does wonder: how much biography is too much? I am not qualified to judge on where the boundaries should be. In the past few years, I’ve read every new book about William James as they were published: Deborah Blum’s Ghost Hunters: William James and the Search for Scientific Proof of Life After Death, J.C. Hallman’s The Devil is a Gentleman: Exploring America’s Religious Fringe — which uses William James’s biography and methodology from The Varieties of Religious Experience as a framework for looking at new religions like Scientology — and Robert D. Richardson’s William James: In the Maelstrom of American Modernism. In that span of time, I have also read a large selection of James’ own writings, and started in on his correspondence. Obviously, if someone published a list of everything William James ate throughout his life, I would read it. The James family fascinates, and no matter how much is written and published about this small group of geniuses, the mass does not seem definitive. There is the father, a man obsessed with leaving a legacy, but his only lasting work was his children. Even the two younger brothers, Wilkie and Bob, are worth writing about — not because of their successes, but because of their failures. All five children grew up in the same bizarrely dysfunctional family, and yet the parents only expected two to amount to anything — William and Henry, Jr. They were protected from enlisting in the Civil War — sparking much protest from the brothers themselves — while Wilkie and Bob were pushed into service. William and Henry had their education and extended trips to Europe paid for, and Wilkie and Bob were forced to take jobs they hated in distant parts of the country. William was a groundbreaking philosopher, and wrote the first definitive study of psychology. Henry Jr. became a bestselling author who is still taught in high schools and colleges. Bob died an alcoholic. Wilkie never recovered from a Civil War wound and died in his 30s. Both were penniless, cut out of the family will, miserable, and estranged. 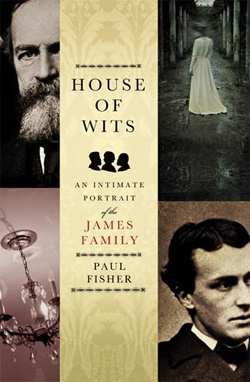 Paul Fisher’s House of Wits: An Intimate Portrait of the James Family takes yet another look at this family, this time concentrating on how the family functioned as a whole. (Hint: not well.) From the “marriage” between William and Henry Jr., to the teasing flirtation of an older brother and his younger sister, to the outright declarations of which son (never daughter) is the “favorite,” to the mother Mary’s sister — who was also wooed by Henry Sr., but not chosen for marriage — living with the entire family while the father publicly praise free love, “dysfunctional” barely begins to describe them. No wonder yet another writer has found a reason to write their story. Unfortunately, Fisher is a little too aware of what has come before him. He spends a lot of time pointing out what other biographers missed. He repeatedly injects asides like “while other biographers have failed to notice…” as if he feels the need to justify his book’s existence. While recounting William’s passionate friendship with Emma Lazarus — nothing physical, just a lot of tormented letters — Fisher writes as an aside, “Though it reveals crucial aspects of William’s personality, it doesn’t appear at all in most biographies of him.” It’s not clear which “it” he is referring to, however. Fisher’s conclusion that William’s flirtations with women other than his wife revealed how he “spoiled to be admired”? Or the fact that he shared detailed information about his crushes with his wife? William was always the Victorian equivalent of today’s drunk e-mailer, writing letters late at night that were overly intimate and way too revealing, and then sending them to women he admired. He begged Alice Gibbens, before she eventually married him, to leave him. He outlined all the reasons he should die alone and not perpetuate the James genes. The fact that he continued this habit for the rest of his life, and with women other than his wife, is not that surprising. Just take a quick look at his collected correspondence. Fisher chose to spend his time pointing out how thorough he is, instead of commenting on things like how Lazarus’s death at the age of 38 may have affected William. Fisher makes a few surprising omissions throughout the book. Obviously, a detailed examination of the entire family would break your bookshelf and take decades to complete, but it’s strange that Fisher chooses not to explain Emanuel Swedenborg and the impact the writer had on the family. Henry James, Sr. was deeply influenced by the philosopher, and after a moment of conversion/nervous breakdown, he considered himself a Swedenborgian mystic until his death. 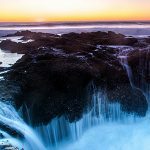 The father’s theological obsessions shaped the family and were one reason the family was occasionally uprooted and transported back and forth the Atlantic Ocean. His father’s work in theology also had a huge impact on William’s Varieties of Religious Experience, which goes mostly unsaid.